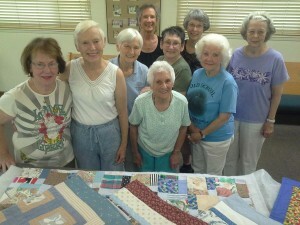 Members of Peacemakers quilting group at Peace Lutheran Church include, back row from left, Norma Toles, Chairwoman Marilyn Engleking; middle row, from left, Suzie Brasher, Carolyn Bloom, Gloria Baker and Joan Denize; front row, from left, Alice Preuss, Janis Jones and Lois Studt. They meet from 9 a.m. to 12 p.m. Thursdays at the church, 828 W. Main St., Grass Valley. “Every quilt has a story,” says Suzie Brasher, a member of Peacemakers quilting group at Peace Lutheran Church in Grass Valley. Many stories start in the church’s fellowship hall, where up to 15 or so women gather every Thursday morning to design, cut, piece and sew quilts. The women’s creativity has produced hundreds of quilts over more than 35 years. Their work binds them together in sisterly love as they trace the threads of their lives. People needn’t be church members to join, says Peacemaker Lois Studt as she stitched bright blocks. 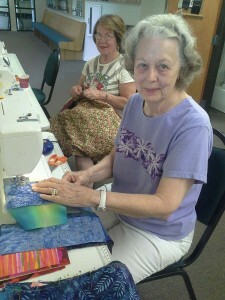 “This is a great place if you like to sew and play with color,” Studt adds. Tropical greens, autumn reds, baby blues, purple octopuses and yellow flowers dance on quilts for cribs, walls, refugee housing and student beds. Peacemakers’ quilts find their way to the Maternity Health Center at Sierra Nevada Memorial Hospital in Grass Valley, to raffles for the local nonprofit Women of Worth, to Shriners Children’s Hospital in Sacramento, to hurricane victims along the Gulf of Mexico and to tornado victims in Oklahoma. More quilts are given to babies baptized at the church and to Peace’s teenagers when they graduate from high school. Peacemakers quilting group members Lois Studt, front, and Suzie Brasher say people don’t have to be church members to come “play with color” from 9 a.m. to 12 p.m. Thursdays at Peace Lutheran Church, 828 W. Main St., Grass Valley. On a recent Thursday, the smell of cotton, the whir of sewing machines and the hum of small talk filled the church fellowship hall. Then, a break for coffee and chocolate cake brought the women around tables for the fellowship that warms their charitable mission. “It’s the friendship and the learning. I’ve sewn all my life, but here, you learn something new,” Janis Jones explains. More info: Call Chairwoman Marilyn Engleking at (530) 268-9205 or the church office at (530) 273-7331.